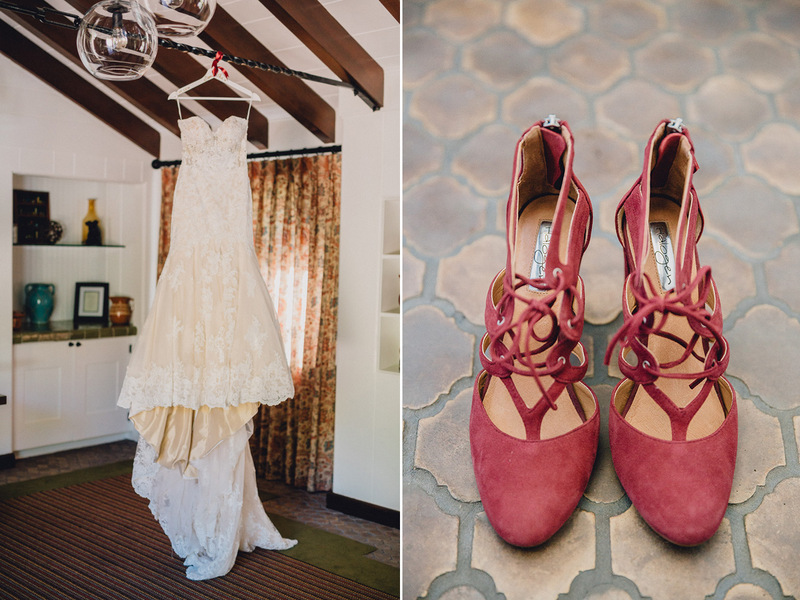 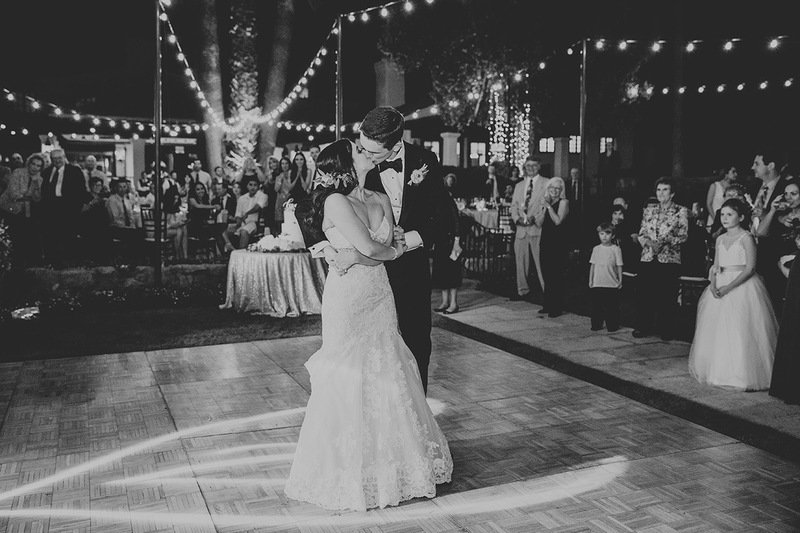 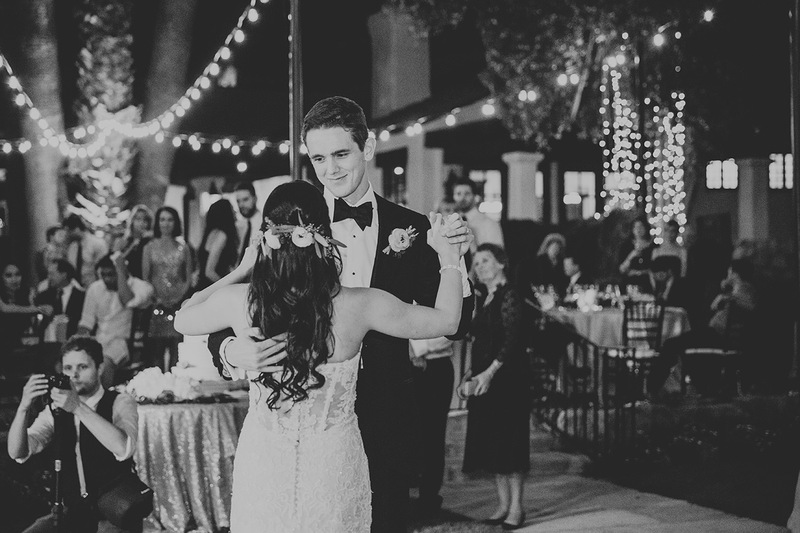 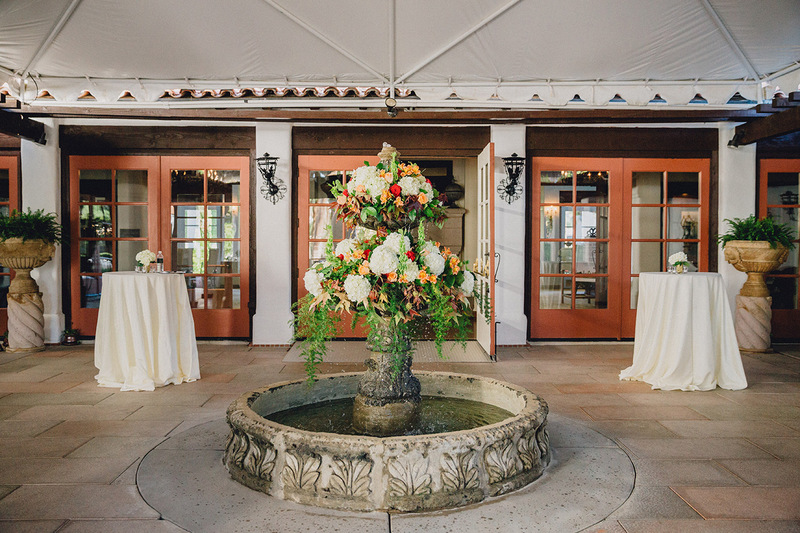 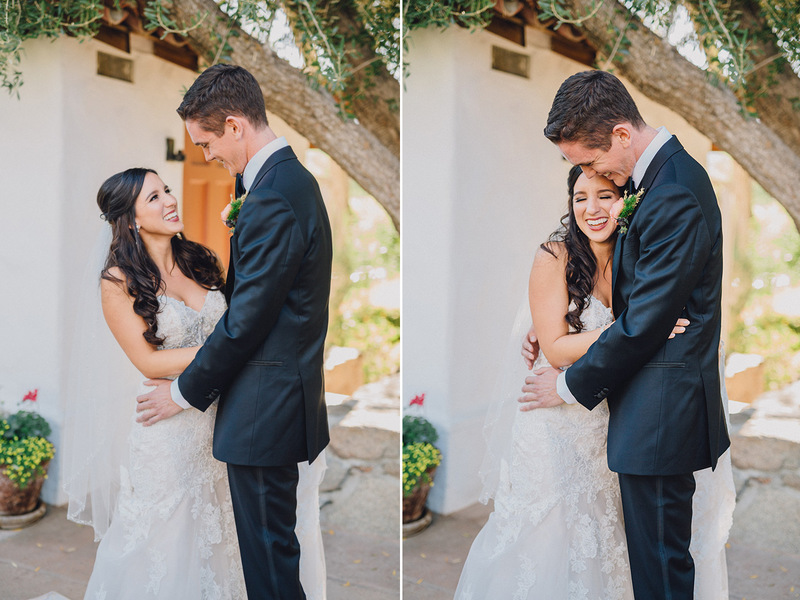 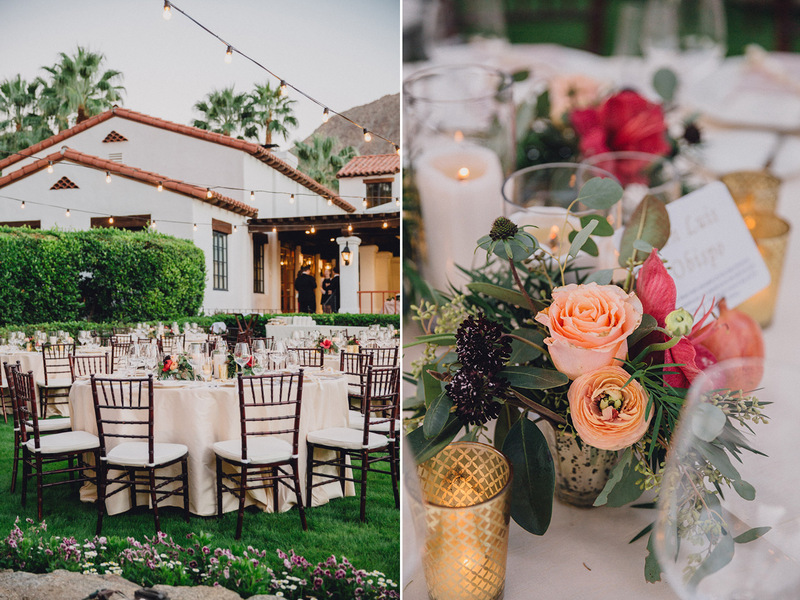 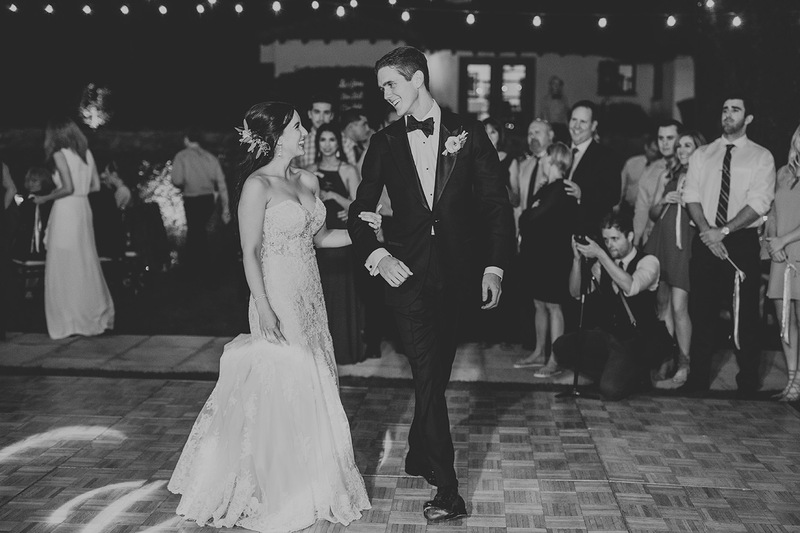 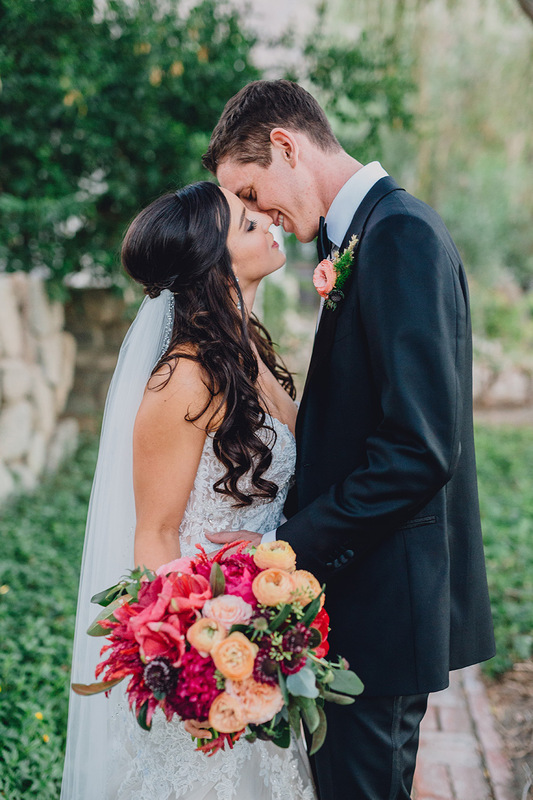 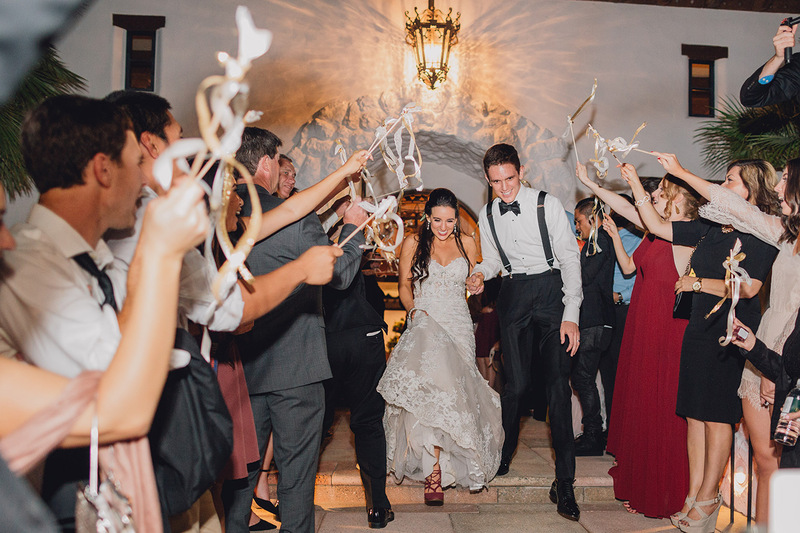 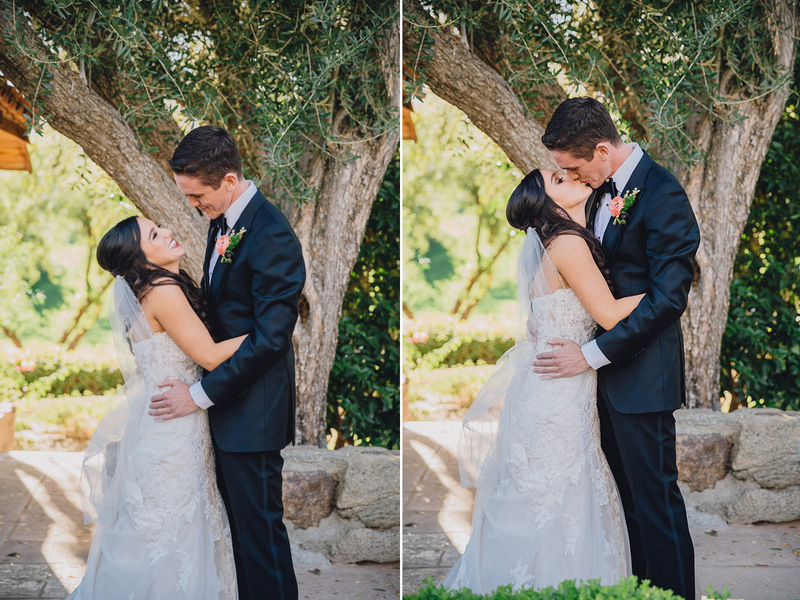 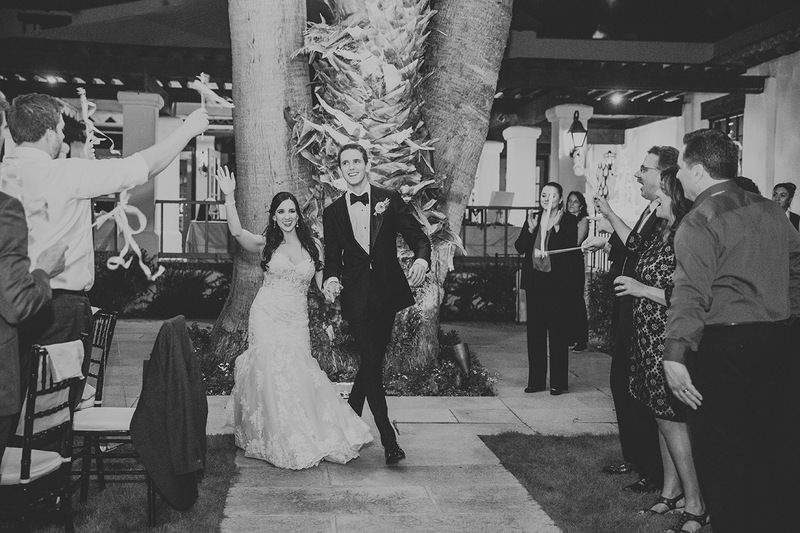 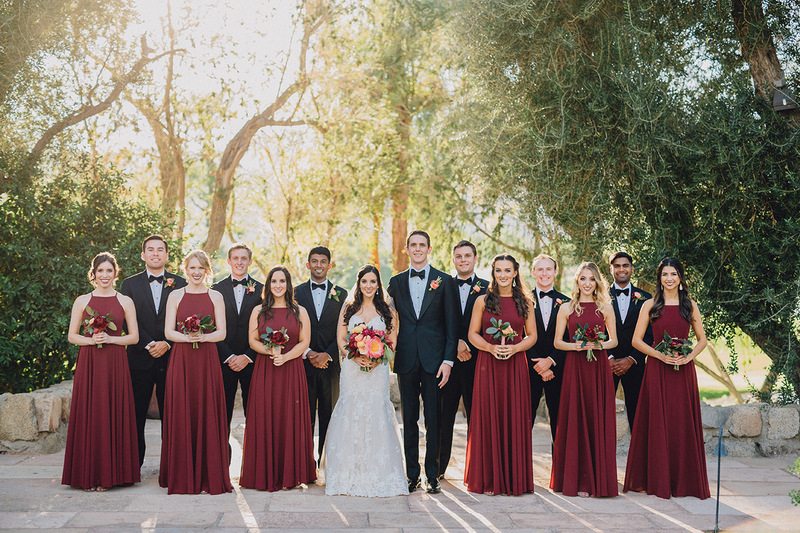 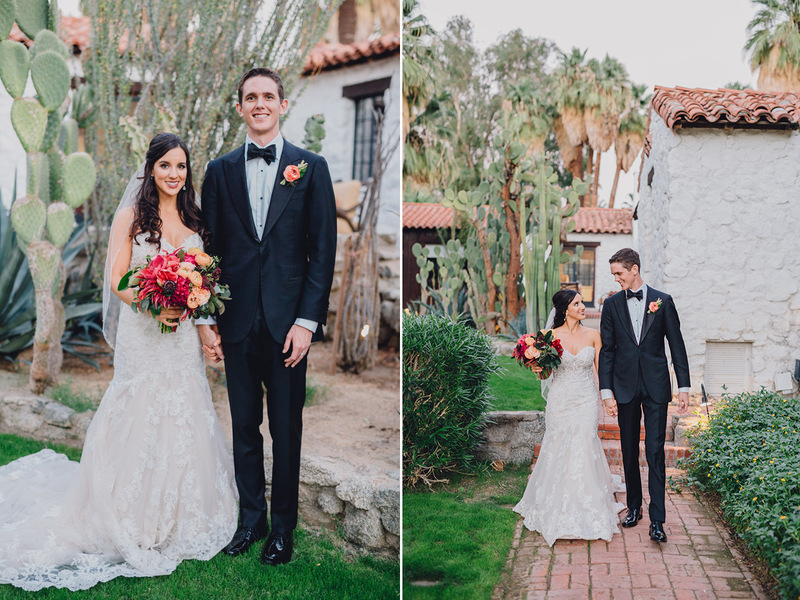 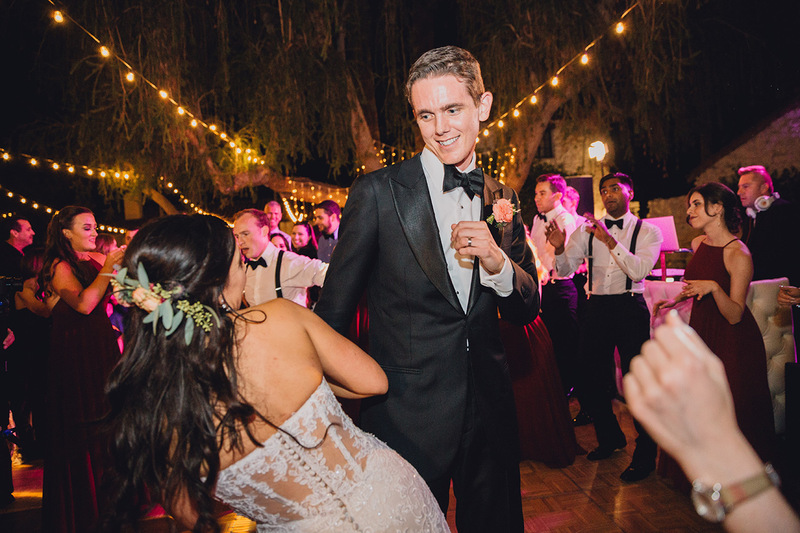 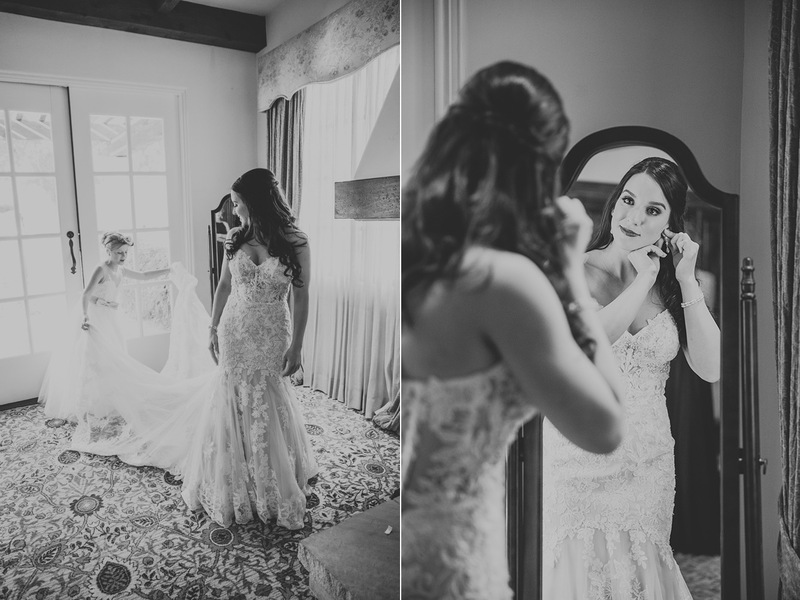 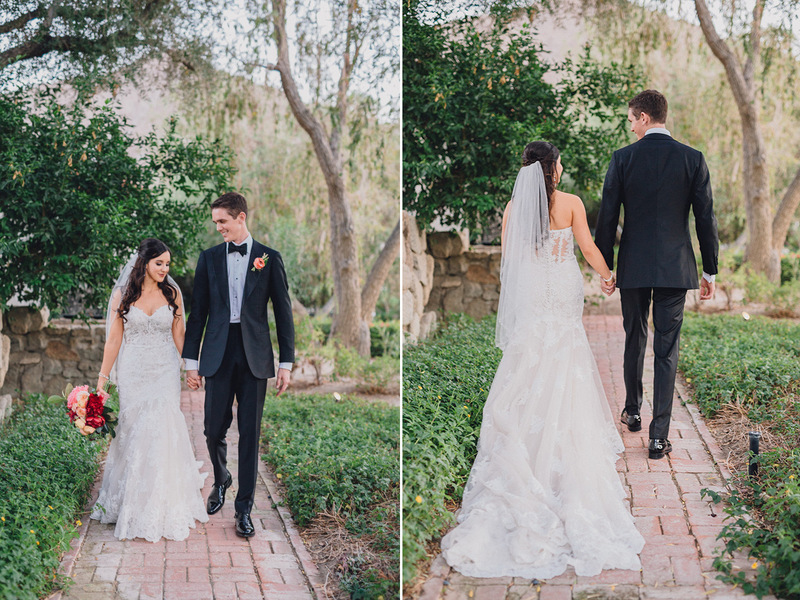 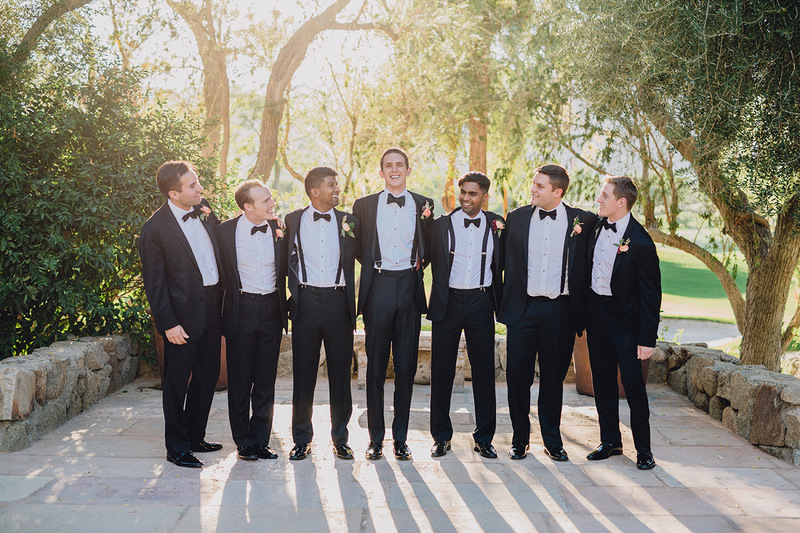 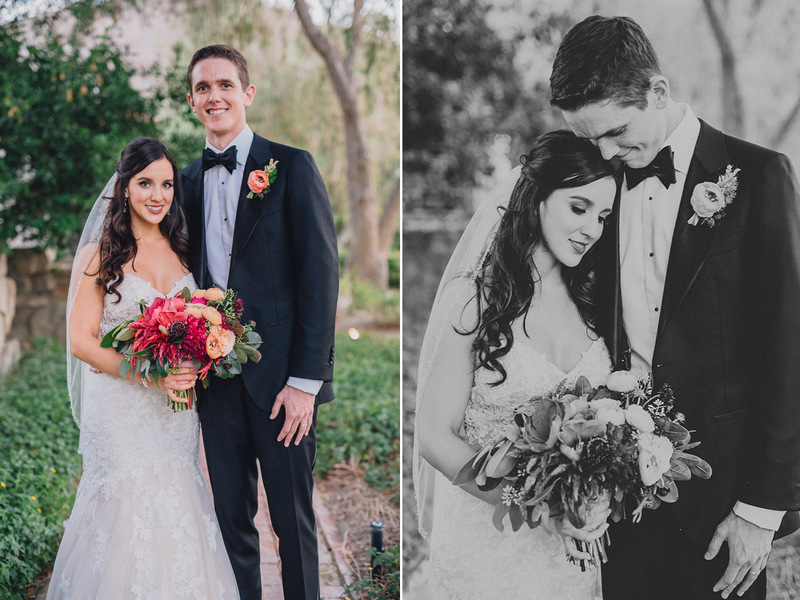 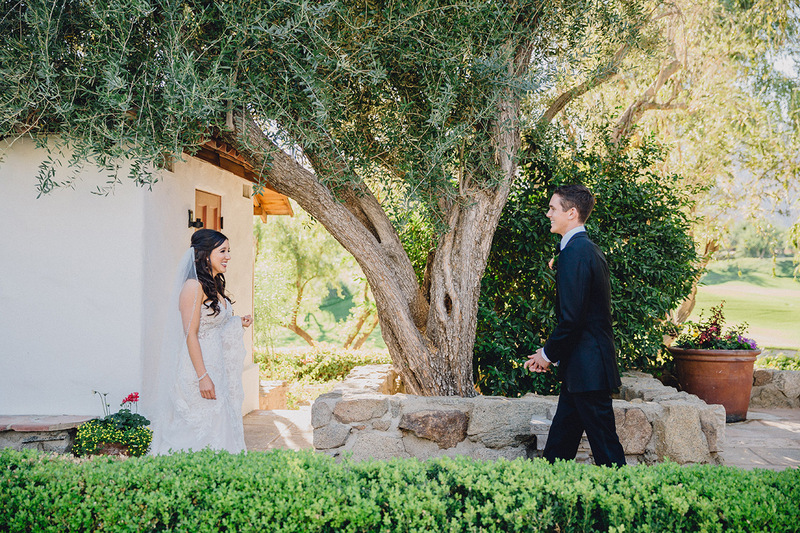 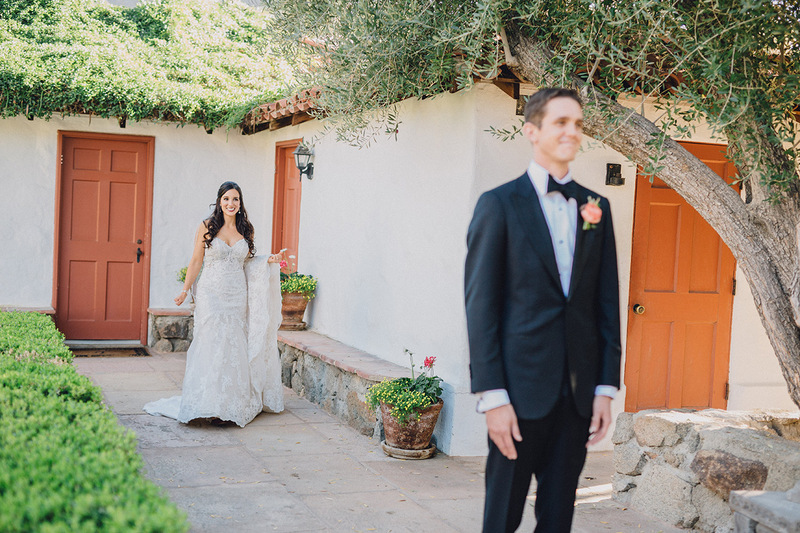 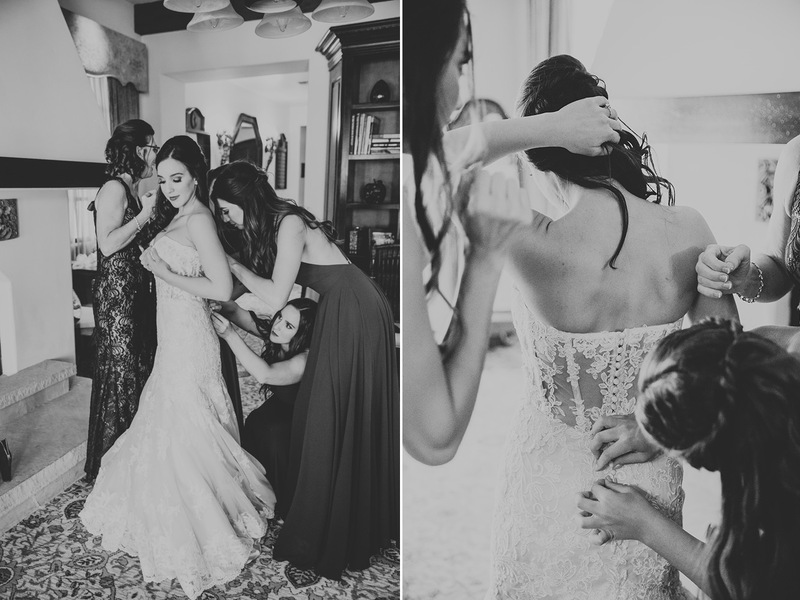 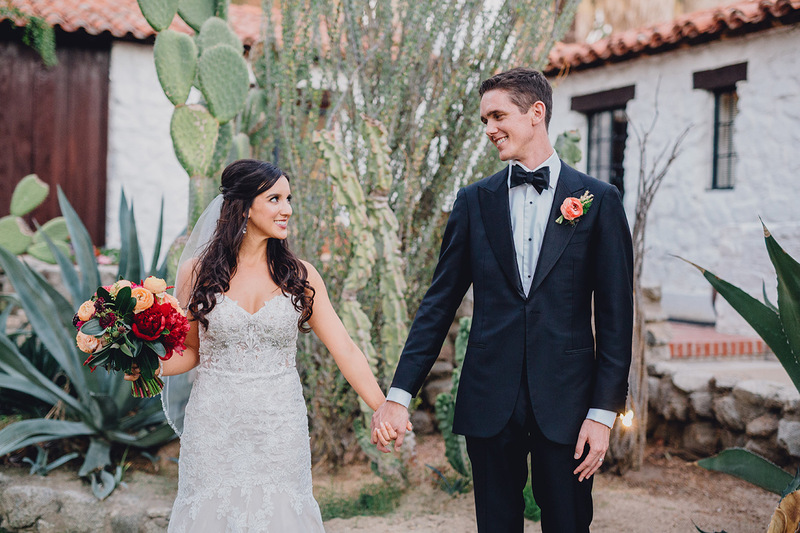 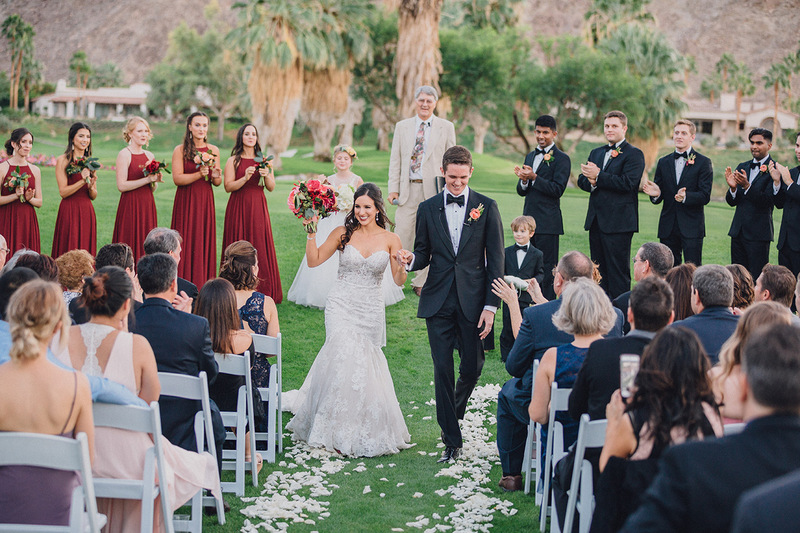 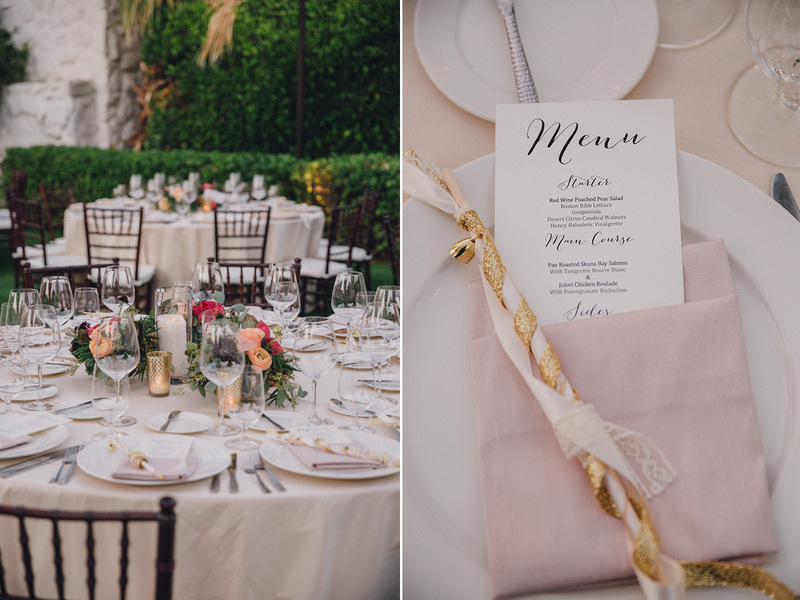 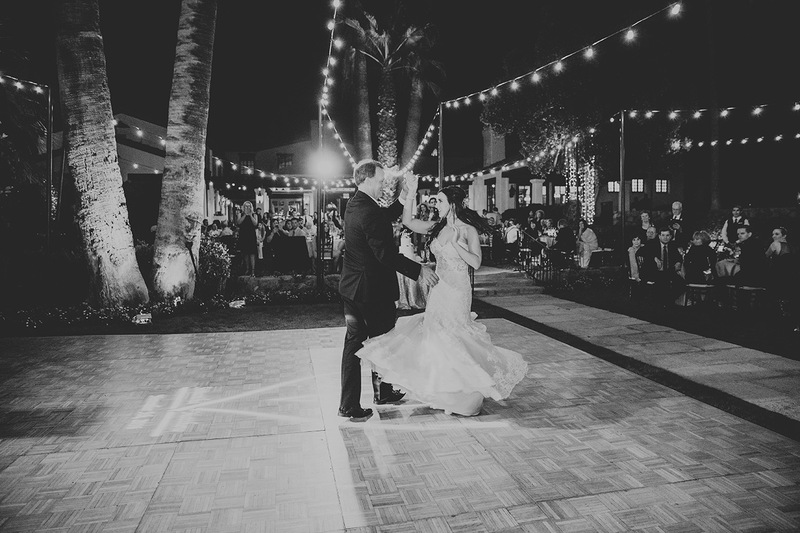 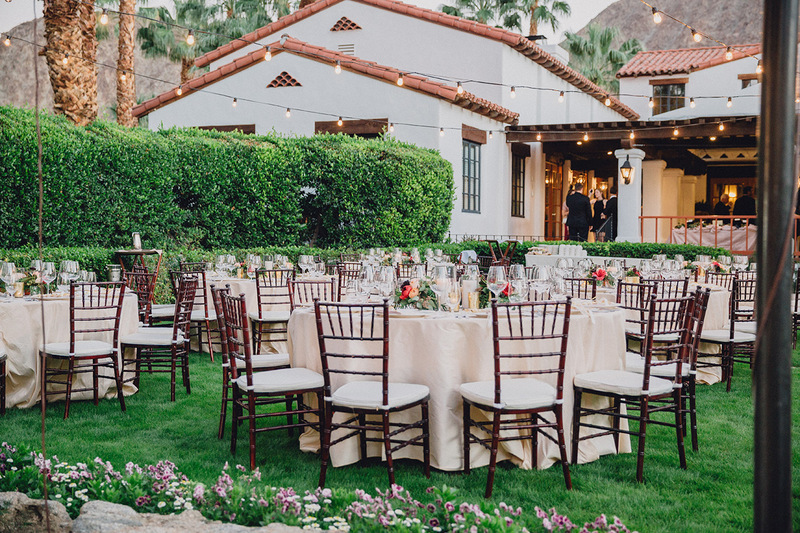 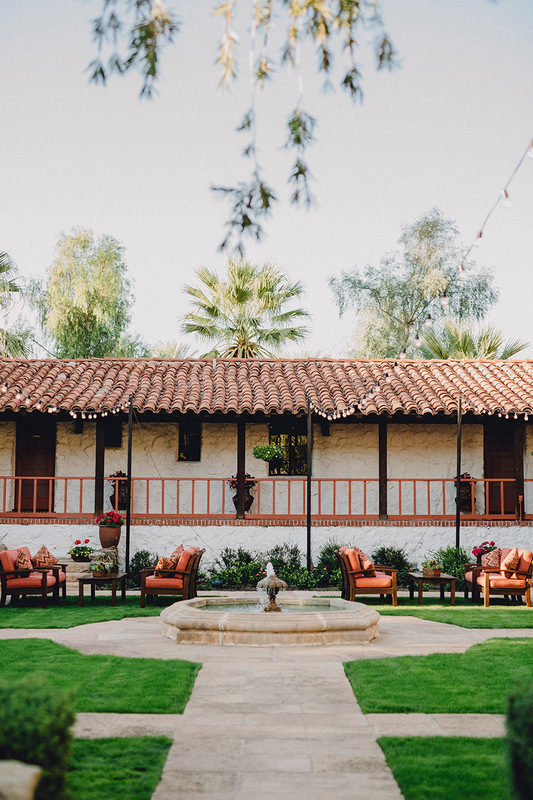 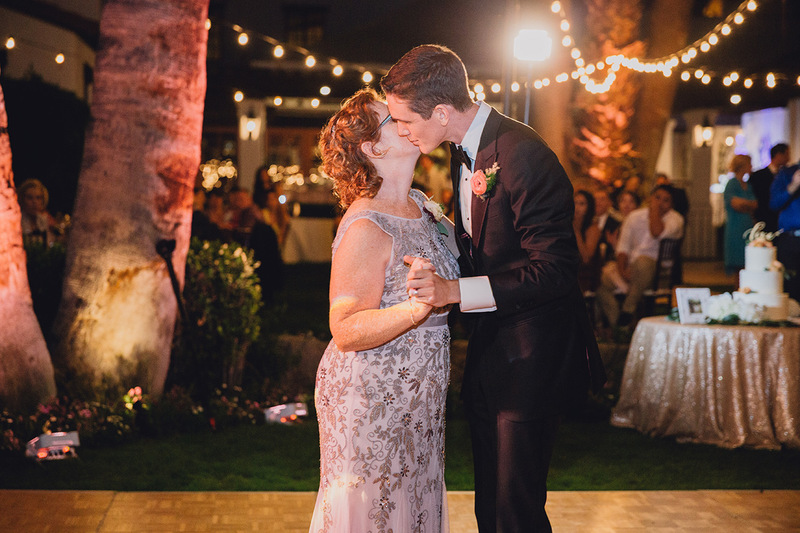 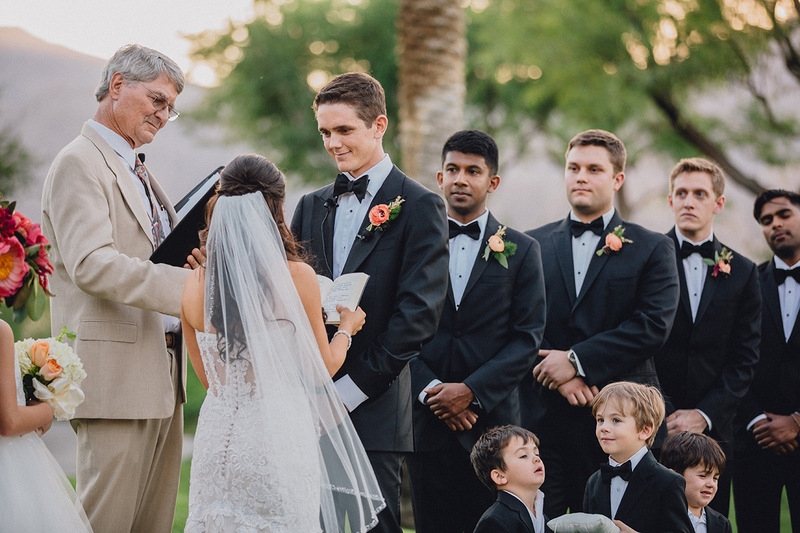 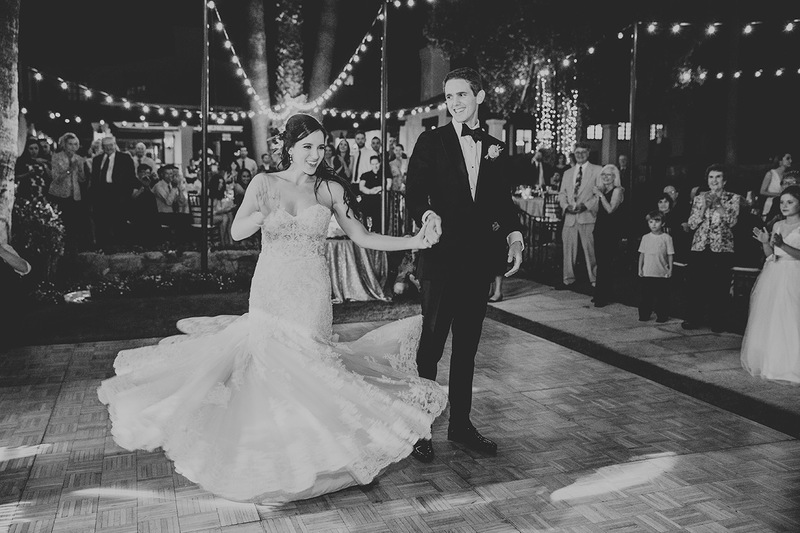 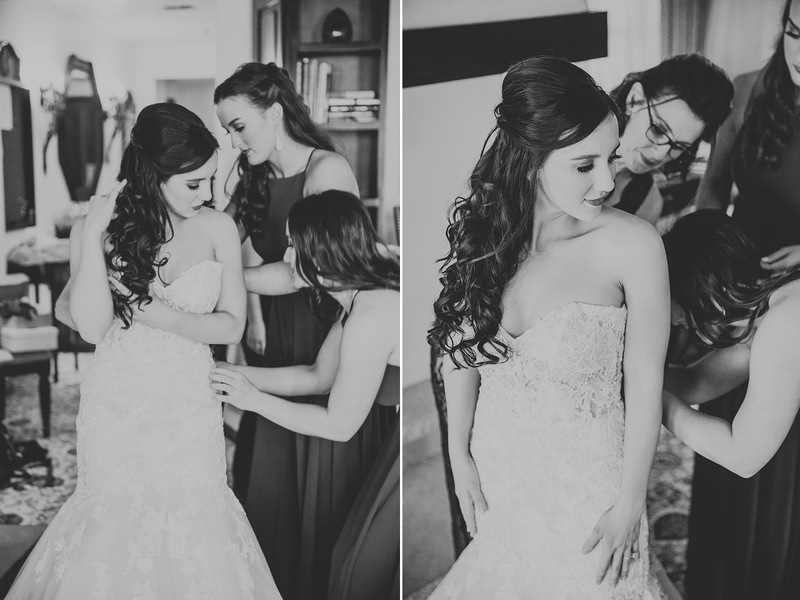 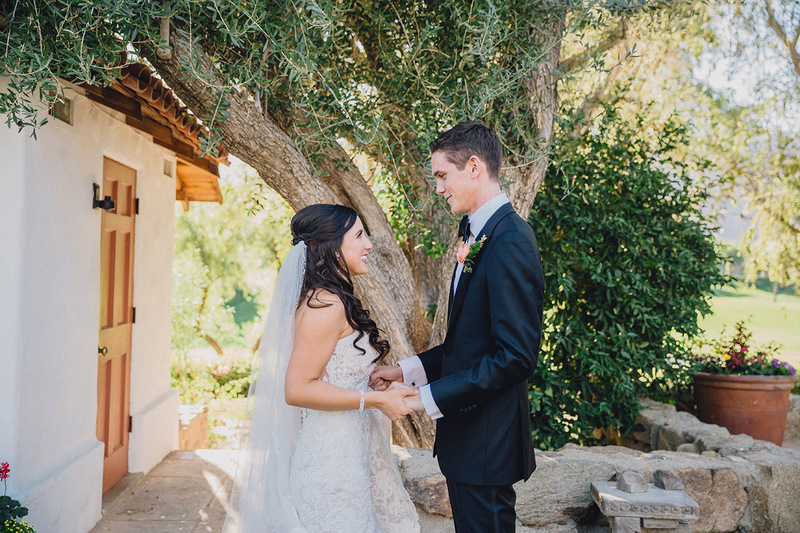 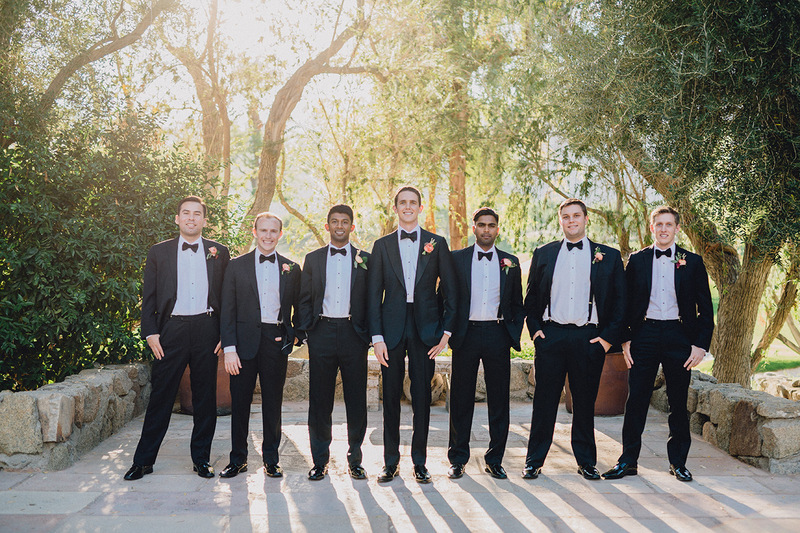 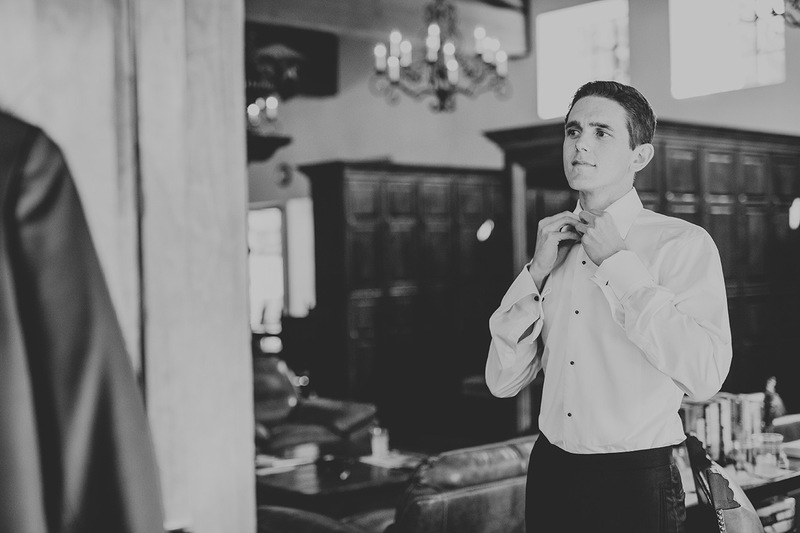 The Tradition Golf Club in La Quinta plays host to Samantha and Matt’s stunning wedding. 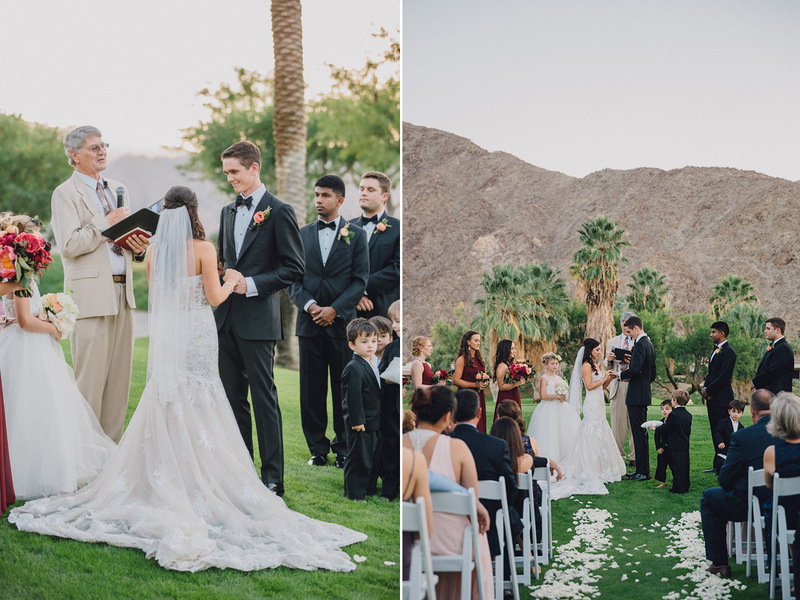 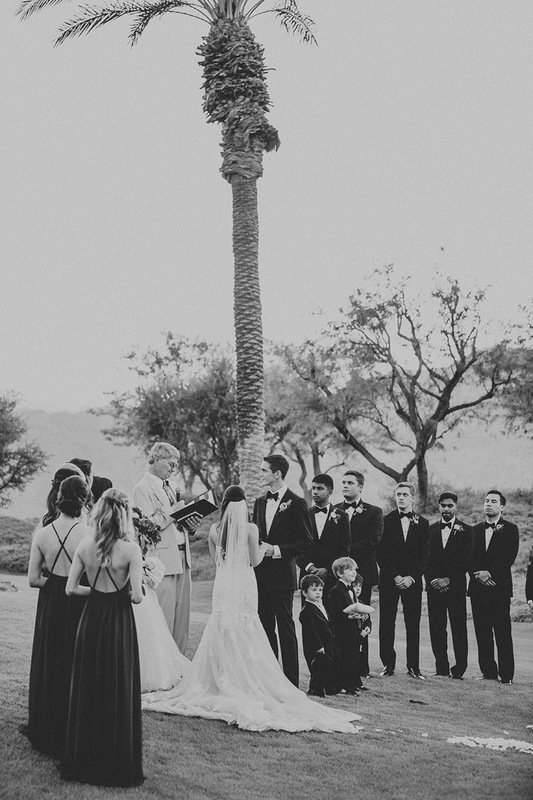 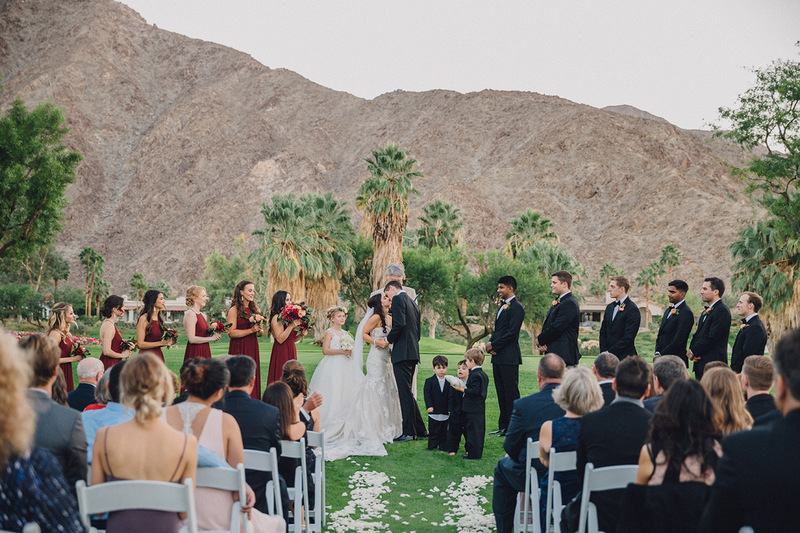 With desert mountains and towering palm trees lining each photo, their ceremony opts for outdoor romance. 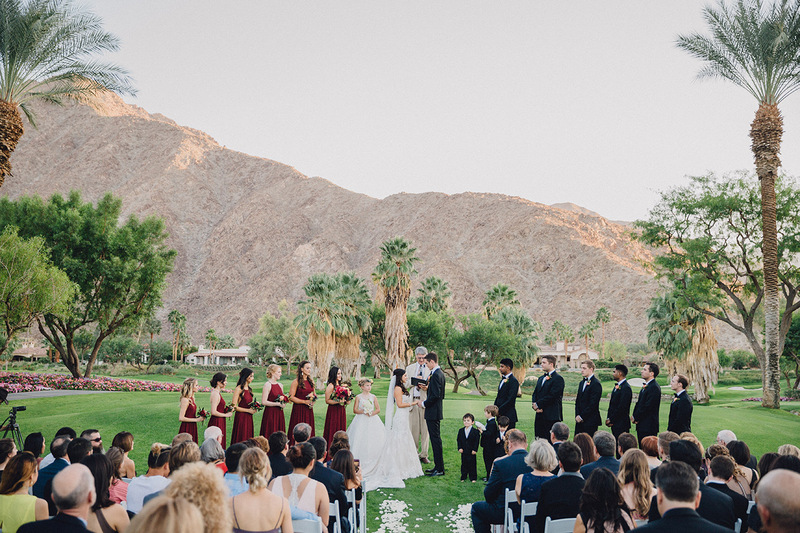 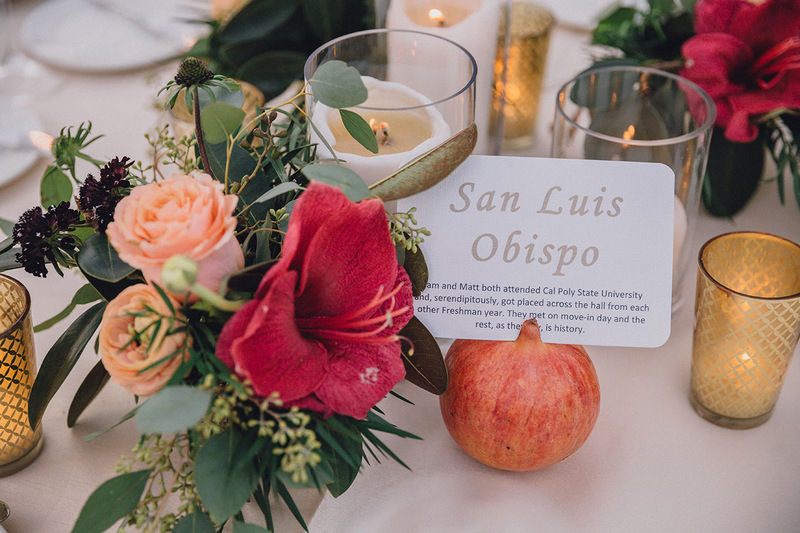 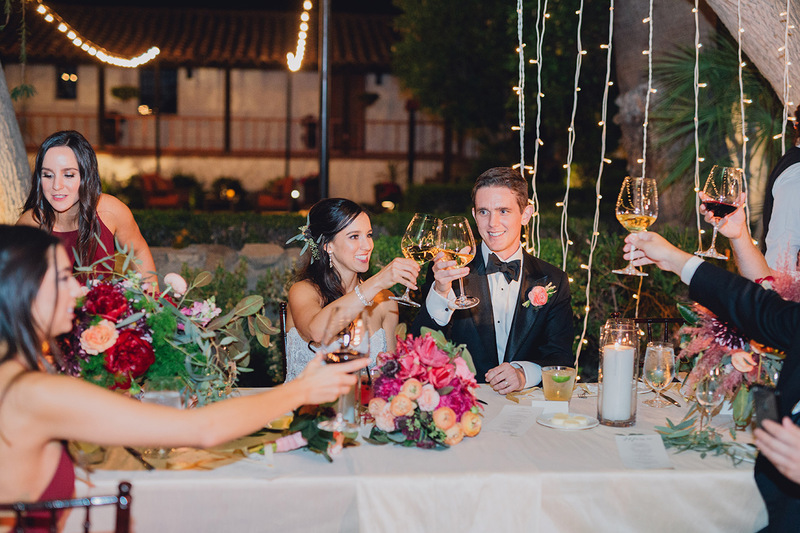 As a result of the picturesque backdrop, the happy couple secure the ultimate Californian wedding celebration! 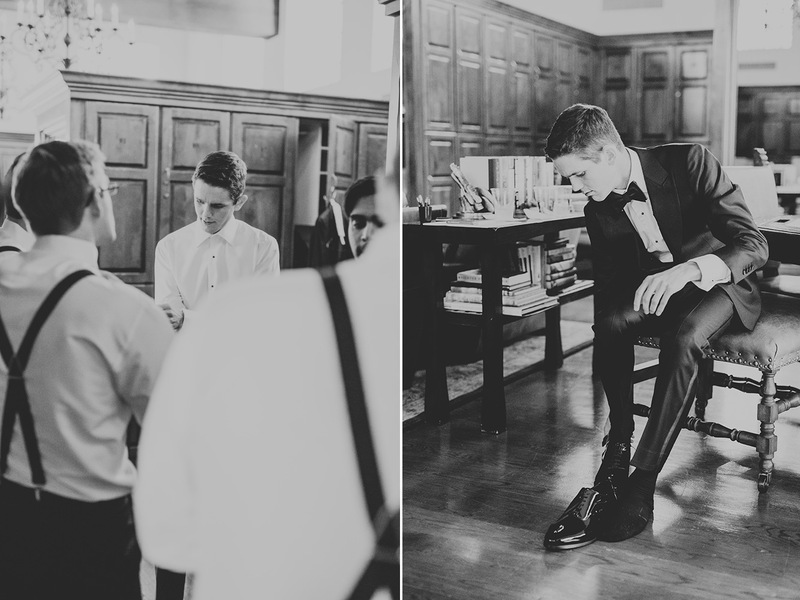 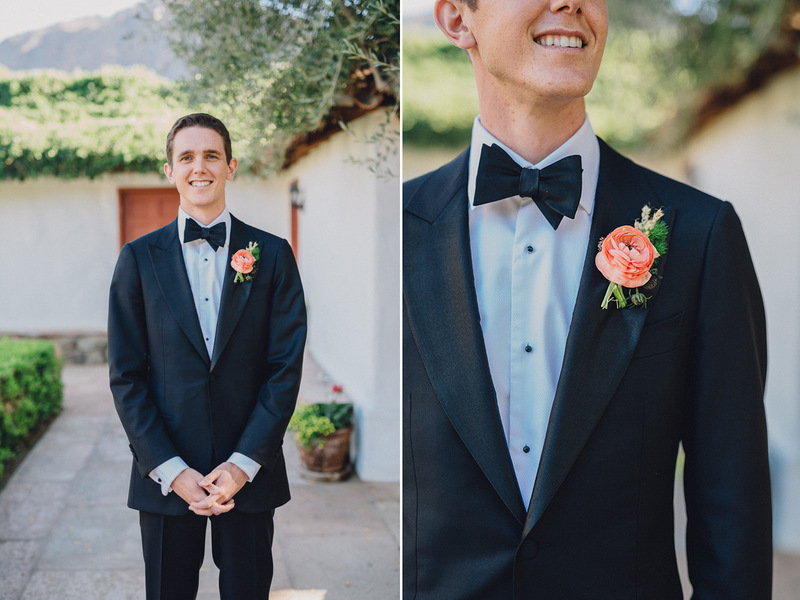 The groom opts for a simple dark suit, adorned with a peach flower. 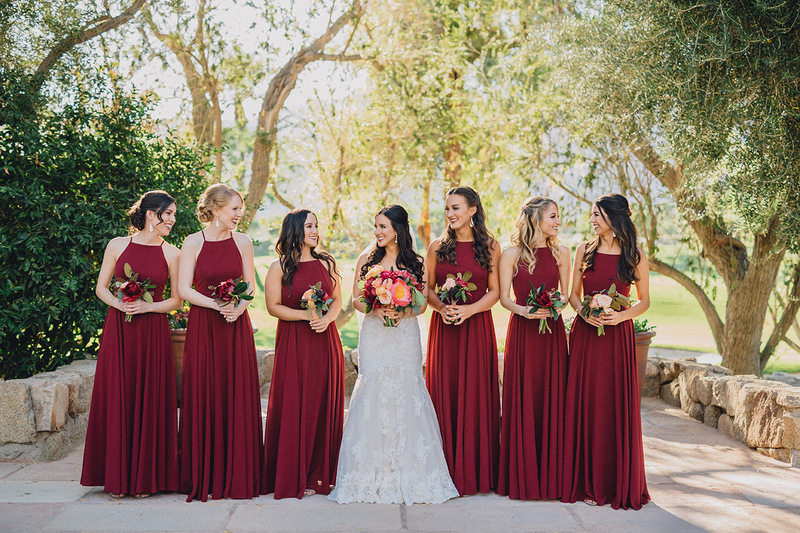 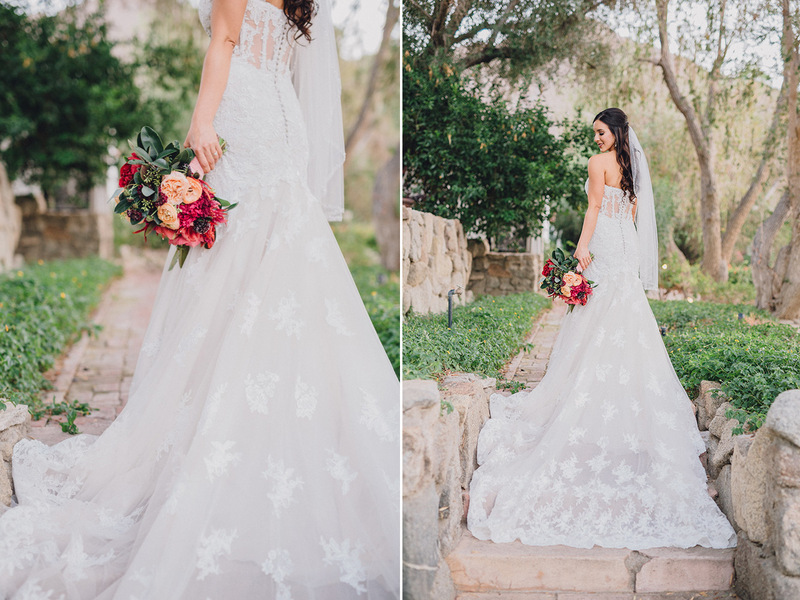 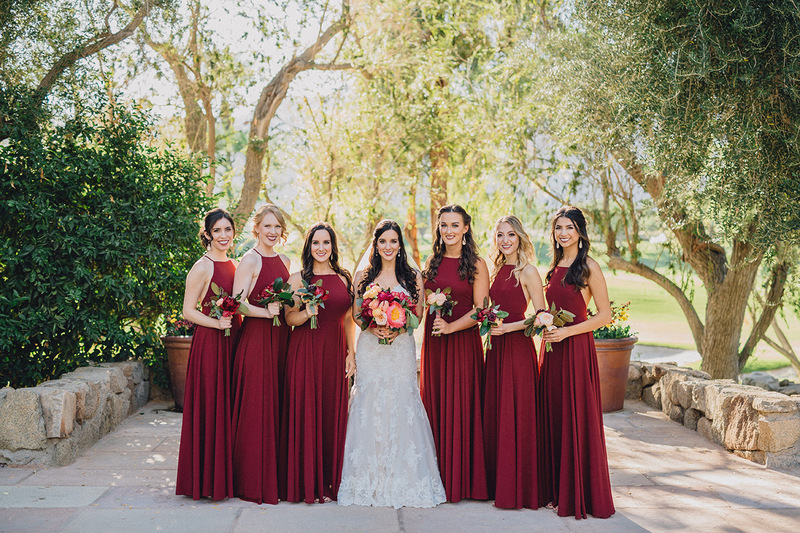 Whereas the bride wears a lace and flower applique gown with a stunning chiffon tail, matching her shoes to the rich, burgundy color of the bridesmaid dresses. 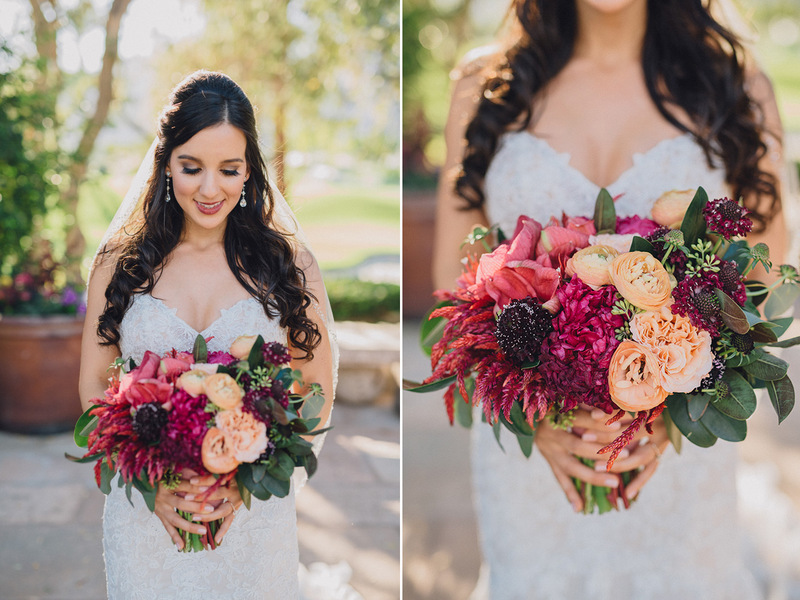 Similar hues are also in the bridal bouquet; a fabulous arrangement of fuchsia wildflowers, blush and peach peonies. 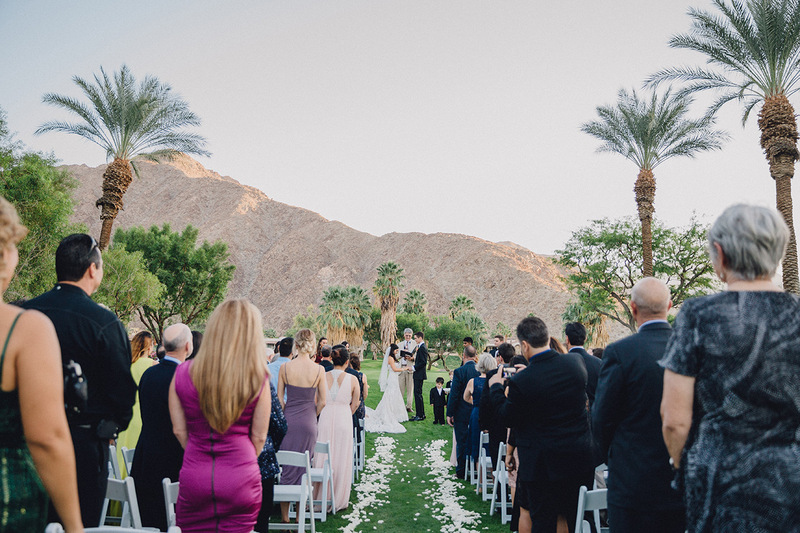 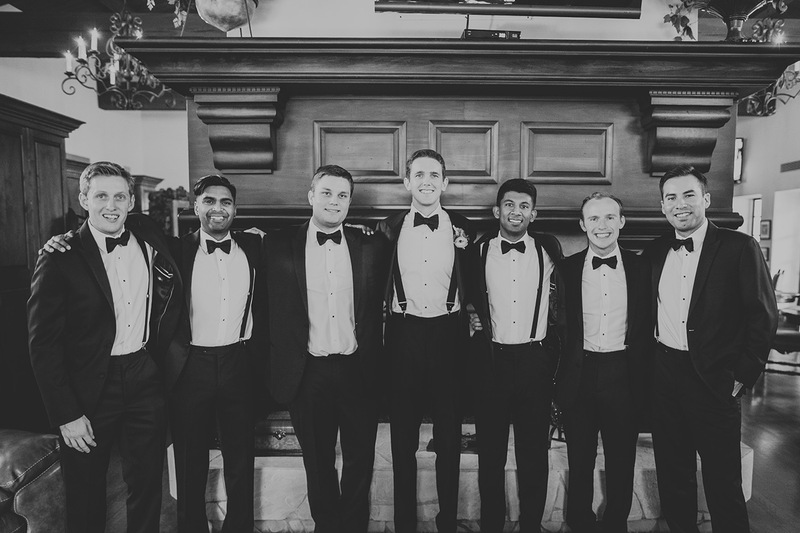 Set in the lush green golf club gardens, nature plays a big part in this wedding aesthetic. 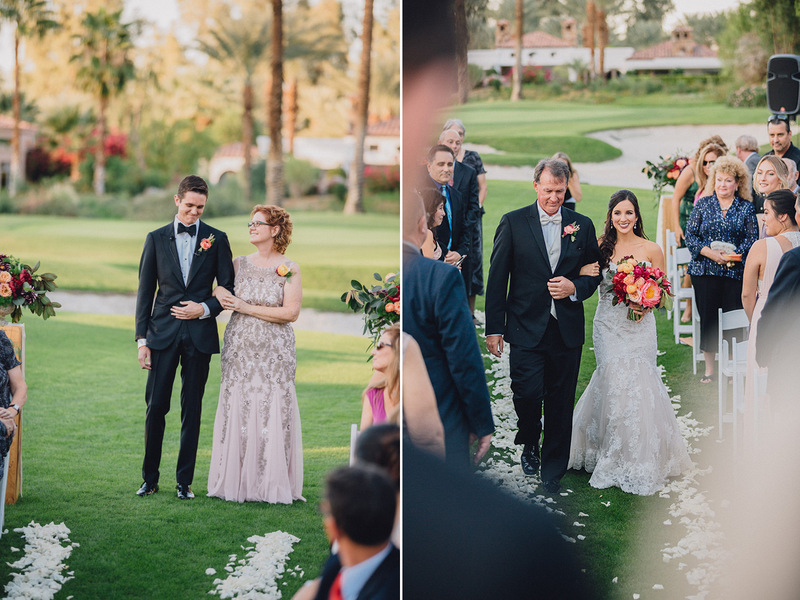 Flower petals line the aisle and shrubbery frames the couple’s wedding photos. 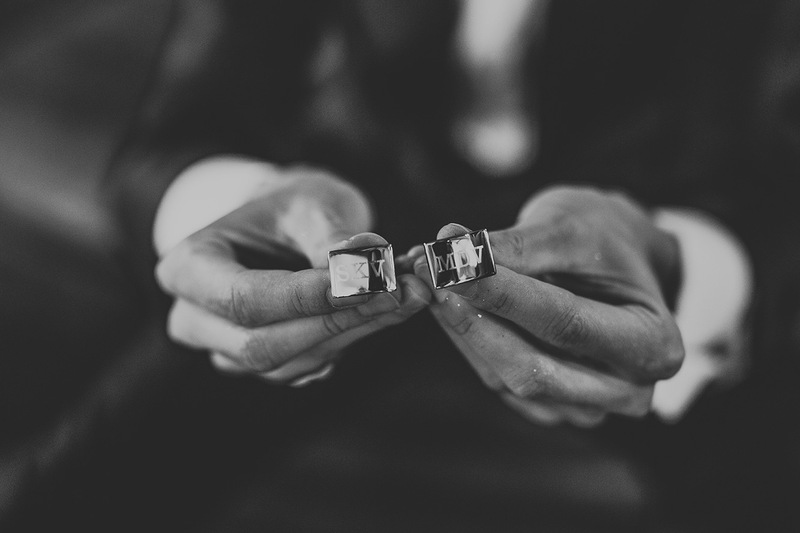 As a result, these small details issue a magical outcome. 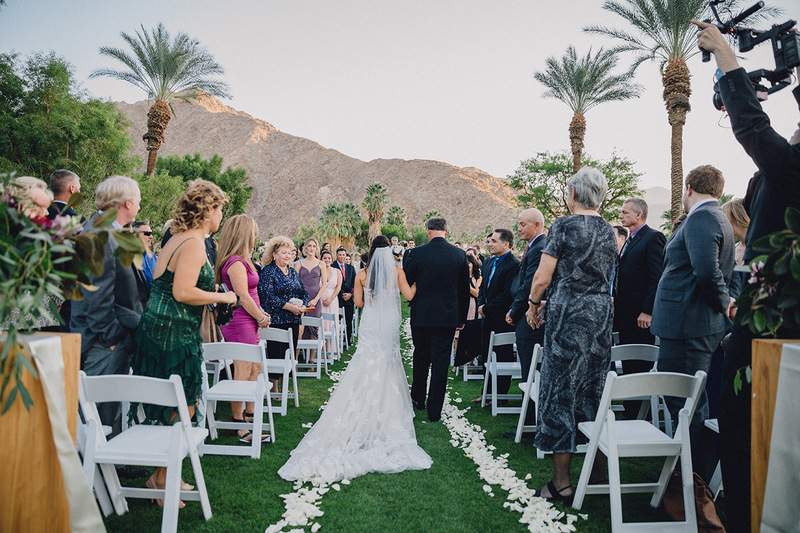 As day turns to dusk, the wedding party moves towards an enclosed part of the grounds. 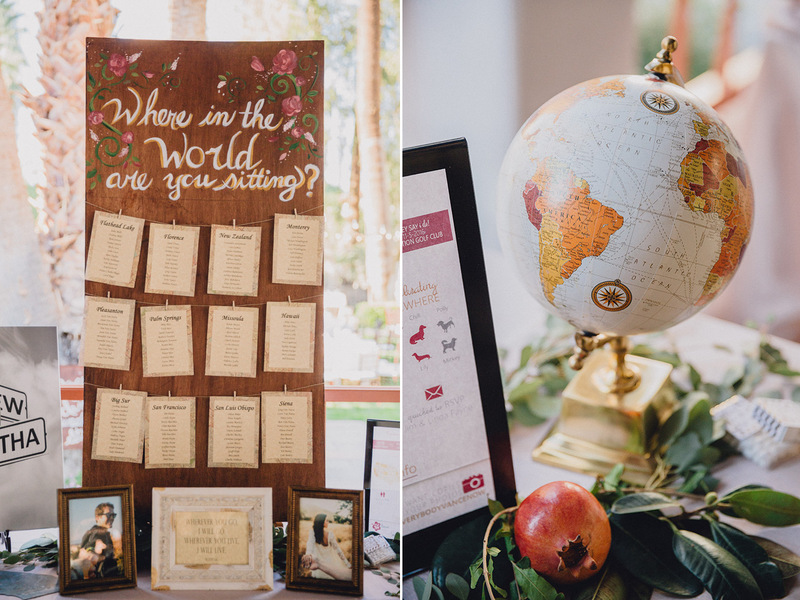 Guests sit according to countries – a great wedding table theme if you and your partner are big on traveling! 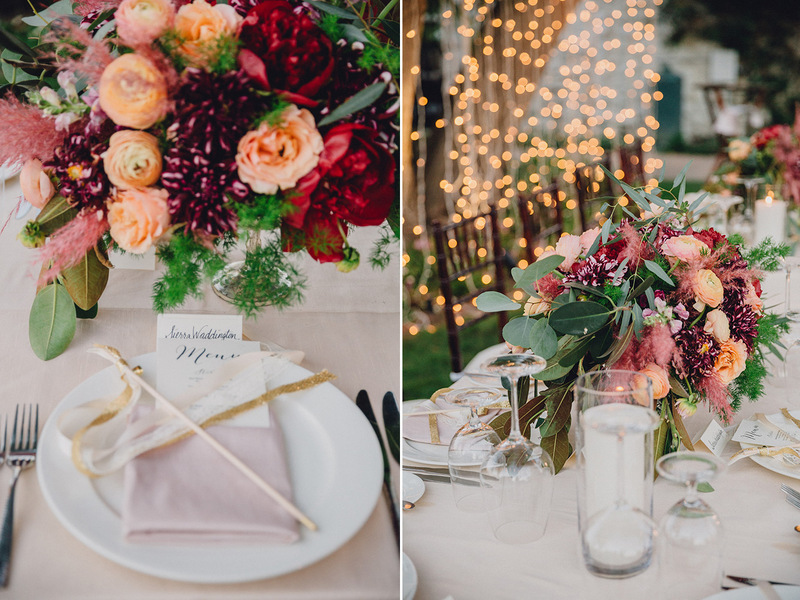 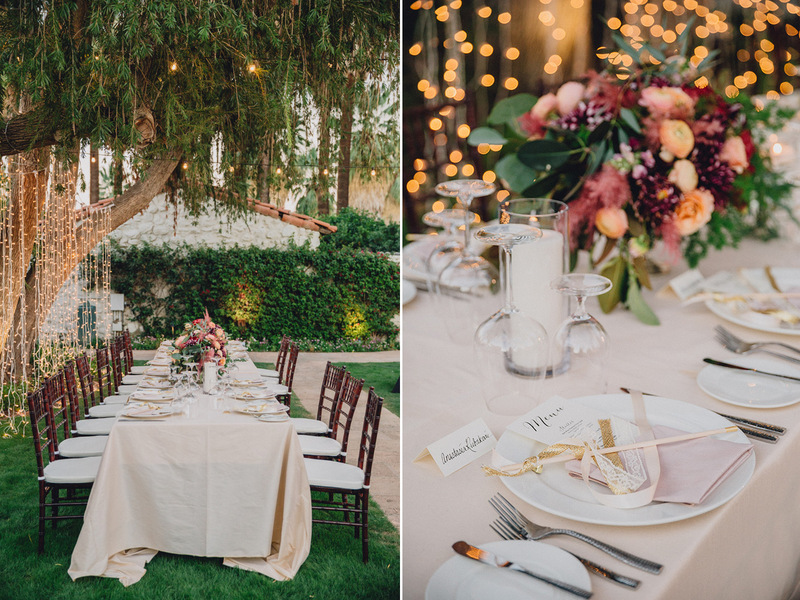 The decor also sees gold and pink tones, whilst fairy lights festoon the courtyard. 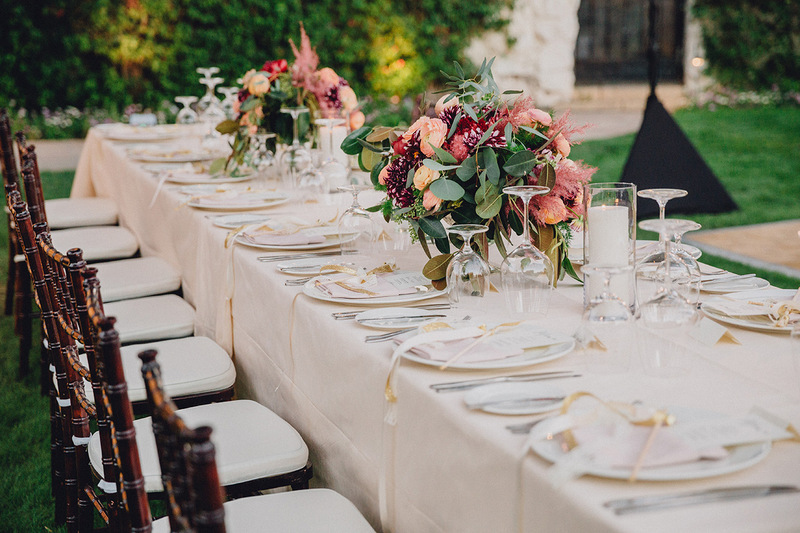 This therefore adds to the ethereal nature of the wedding decor. 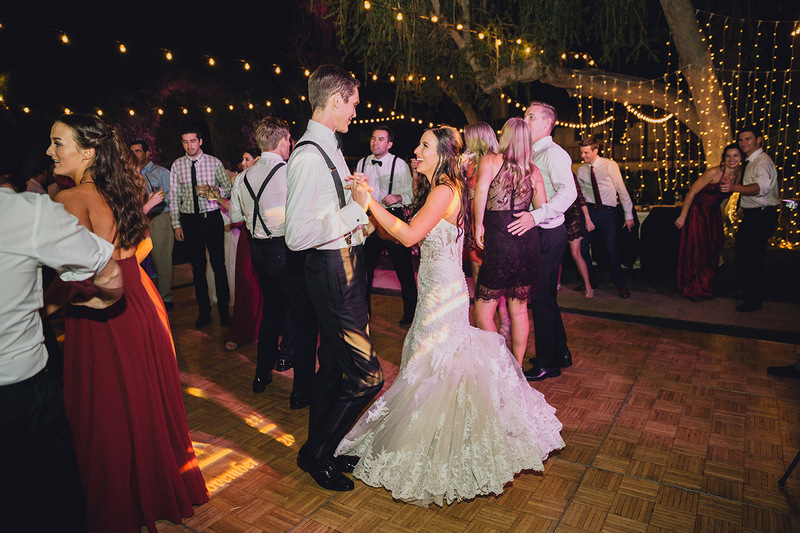 Furthermore, assembling a wooden dance floor above a patch of grass is a great idea if your wedding reception is outdoors. 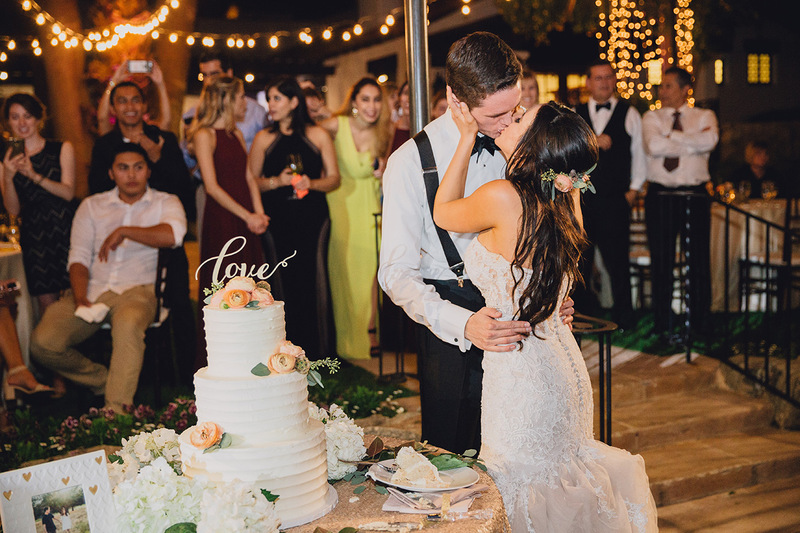 For Samantha and Matt, drink, dance and good times continue and their wedding cake is kept simple. 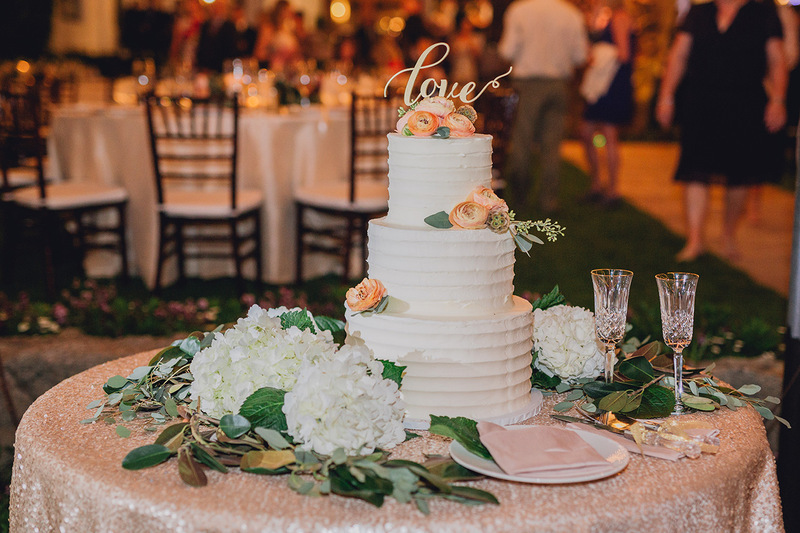 A 3-tiered, cream gateau, sprinkled with peach florals and topped with a banner spelling ‘love’. 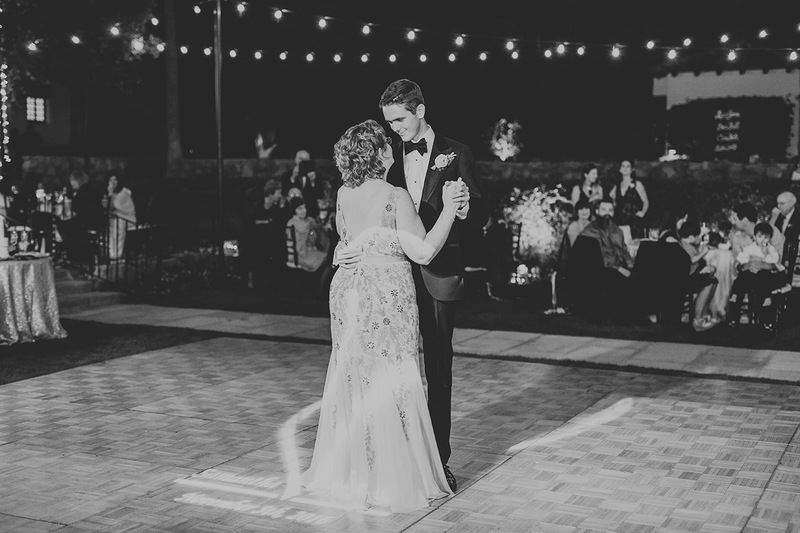 Scroll down to see some of our stand-out images of the night!